Weekly rentals are available in addition to nightly stays. 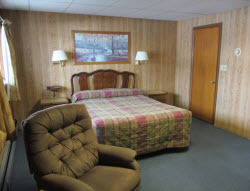 The Deerwood Motel provides clean, comfortable, and very affordable lodging. We do our best of ensure you enjoy your stay in our quiet region of relaxing lakes and rivers. We offer a number of room configurations. Pets stay free in one of our Designated Pet rooms. Shower and bath tub in every room. Main floor and second floor rooms. Refrigerator, Microwave, Coffee, & Cable TV. WIFI internet available in all rooms.